Again, we are back with the latest project ideas for Mechanical Engineering. If you are not able to think out of box Mechanical Engineering project ideas and are bored of old one, then here is the list of new Mechanical engineering projects. You can use below project ideas for Science fair projects, senior projects or for college projects. These project topics have been taken from various websites whose reference is also given. 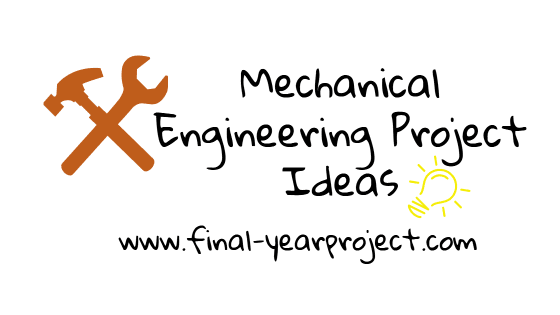 You can also Subscribe to FINAL YEAR PROJECT'S by Email for more such latest Mechanical projects ideas. We have created quite a long list of latest Mechanical Engineering project for 2019-2020, so grab some drink and start reading this list. If you like any idea, just use our search option to search for it. We have already posted reference material for most of the projects. If you have any other ideas for a Mechanical Engineering project in your mind, do share with us through comments and email, so that we can update this list and keep it growing. We will also add more new Mechanical Engineering project ideas to this list, so do subscribe to our email newsletter. How much can we dent and damage an aircraft before it goes POP! Development of really cool toys to promote engineering to school students. Intelligent leading & trailing-edge control system for flexible airfoils. Also check our Top Mechanical projects for final year students. Still not satisfied? Do check our Mechanical section for more project ideas.